Confirmation is the adult profession of promises made on our behalf at baptism. It is open to all those in the Parish who feel ready and able to make this commitment to be a disciple of Jesus Christ. Age is no barrier, but we would not usually expect candidates to be under the age of 11 at the time of confirmation. There is no upper limit and it is never ‘too late’. It is our response to the unconditional love God offers each and every one of us. The Confirmation Service happens once a year in our own or nearby churches – usually with the Bishop of Wolverhampton conducting the special service. More information about confirmation can be found on the Church of England website. 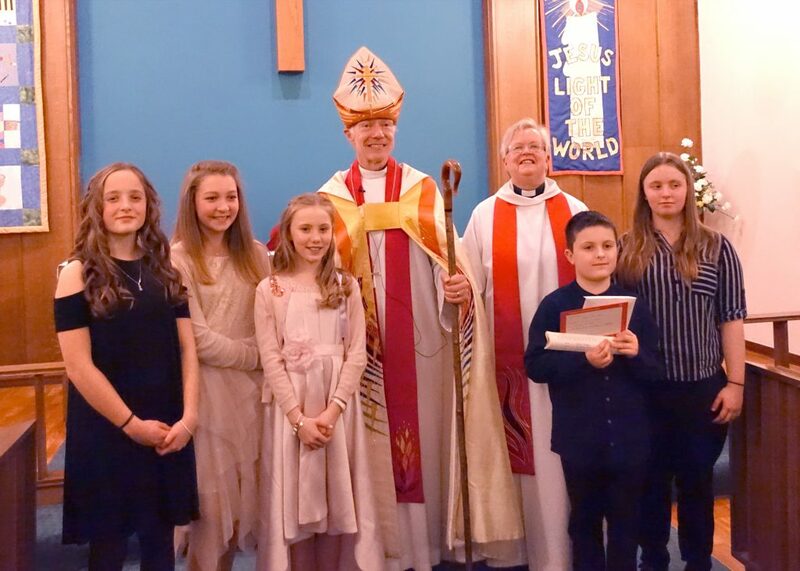 On Sunday 18th March 2018 five youngsters from Pattingham, who had been prepared to confirmation by the vicar, Revd Preb Maureen Hobbs, were confirmed at the Church of the Good Shepherd, Castlecroft by the Bishop of Wolvehampton, the Right Revd Clive Gregory. At a special Service held on the evening of Wednesday 8th September and conducted by the Bishop of Wolverhampton, Clive Gregory, eight children and two adults were confirmed together with Gena Richards being received into the Church of England. Those confirmed were Claire Ainsworth, Josh Ainsworth, Christopher Bellingham, Timothy Bellingham, James Campbell, Grace Campbell, Rebecca Francis, Samantha Francis, Michael Richards and Cora Vials.